I was sitting in a bar a few days ago and a guy I’d met asked me what film I was reviewing next. “It’s a movie about a guy who’s walking all the streets in New York City,” I told him. “Oh, you mean Professor Bill Helmreich,” he said enthusiastically. “I think the guy’s named Matt Green,” I responded. My bar mate had never heard of him. To be honest, I’d never heard of neither Heimreich nor Green, which goes to show how much attention I’ve been paying to New York City walking projects. 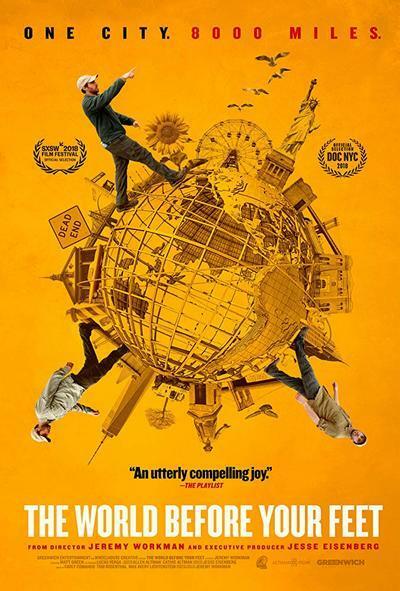 Director Jeremy Workman and producer Jesse Eisenberg rectify that with “The World Before Your Feet,” which chronicles Green’s ongoing project to explore every street, park, cemetery and beach in all five boroughs of the Big Apple. Professor Helmreich appears briefly here, proclaiming that in four years he has walked the estimated 6,000 miles of streets that make up Manhattan, the Bronx, Brooklyn, Queens and Staten Island. That figure, which we see at the beginning of the film, only covers what Helmreich calls “inhabitable areas.” Green’s measurement hews closer to 8,000 miles, as he has been traversing open spaces, deserted areas and the like, while documenting his journey with maps and photographs on his blog. As the project progressed, it became a huge research project as well, supplemented by historical facts about New York City. “Every street is a fossil,” we’re told, and numerous times throughout “The World Before Your Feet,” Green and Workman prove this thesis by discovering remnants of NYC history like the now unused building where Margaret Sanger handed out birth control back in 1916. There are eight million stories in the naked city, as the old TV show used to tell us, and each plays out in hundreds of neighborhoods. Each place has its own quirky charms and idiosyncrasies, much like the people who inhabit them. Green tells us to think of New York City—or wherever we live—like a person we are familiar with yet don’t know completely. It’s Green’s desire to fully know New York, whose geography has been morphing for over four centuries. His quest feels both quixotic and honorable, evoking one of those old English tales of knights on the hunt for the Holy Grail. I won’t disagree with you if you also think Green’s idea is bat-you-know-what crazy. Unless you’ve a vested interest in New York City or, like me, you were born and bred within its confines or in its neighboring shadows, “The World Before Your Feet” may seem like a hard pass for you. But this well-made and intriguing documentary isn’t about New York so much as it is about an unusual idea seen to fruition. Personal location bias aside, this film spoke to the compulsive in me. I felt a kindred spirit while watching Green meticulously plan his routes and wrestle with his unquenchable thirst for knowledge. This feeling extended to the numerous scenes where a giddy Green points out trivial yet interesting facts about what we’re seeing. You can feel his joy and excitement for even the most mundane of details. It keeps the proceedings lively and informative. “The World Before Your Feet” gives background on Green’s former life as an engineer and how he manages to perform this ongoing project every day. He has no apartment and therefore no rent, opting to stay at the homes of people he knows or who have reached out to him based on hearing about his prior completed quest of walking from Rockaway Beach, NY to Rockaway Beach, Oregon. Green has concocted a clever system consisting of cat sitting opportunities, couch surfing and the kindness of strangers. He eats meagerly and uses the money he saved from his engineering career when necessary. Any notion of him doing this for publicity seems quashed by the discovery that “perhaps 12 people” read his blog despite Green’s earlier profile in the New York Times. Quite often during his walks, Green becomes distracted by what he’s seeing, stopping to take a picture he earmarks for further research or to point out something unusual for the camera. There are entire sections of the film devoted to flowers and vegetable gardens, to barber shops who spell “cuts” with a z instead of an s and to the lonely, deserted places that once contained the bustling lives of denizens long since past. So much information gets processed or recorded that it seems this journey will never end. “This is more about the parts than the whole,” Helmreich notes when comparing his project to Green’s, and late in the film, Green acknowledges that he may never finish. The best scenes in the film come from Green’s interactions with people he meets on his route, from friendly, inquisitive passersby to walkers on similar quests who wish to join him for a day. One such walker, a Jamaican man named Garnette Cadogan, is a New York City transplant like native Virginian Green. Cadogan provides an example of the film’s willingness not to blunt some of the sharper edges in its story. He talks about his “pantomime” of a costume, that is, what he wears and how he presents himself so that he appears “non-threatening” to people because he’s Black. He carries a book, wears glasses and avoids hoodies and other “ethnic” wear. Indeed, Cadogan looks like a Buppie when we see him, a striking comparison to some of the Oscar Madison-style slumming attire Green has on at different points in the film. At one point, Green tells the story of Charles “Mile-a-Minute” Murphy, a New Yorker whose wild ideas about bicycling a mile a minute behind a train endured initial scorn and eventually got the Long Island Railroad to build two miles of track so he could test his theory. Green visits Murphy’s gravesite and it’s clear he identifies with him. If Murphy is the film’s patron saint, its biggest symbol is The Queens Giant, a nearly 400-year-old tree that’s been around long enough to see the evolution of every nook and cranny Green seeks to explore in New York City. “I don’t know anybody like that,” he adds sheepishly.